The settings in this section help to configure your local repository. 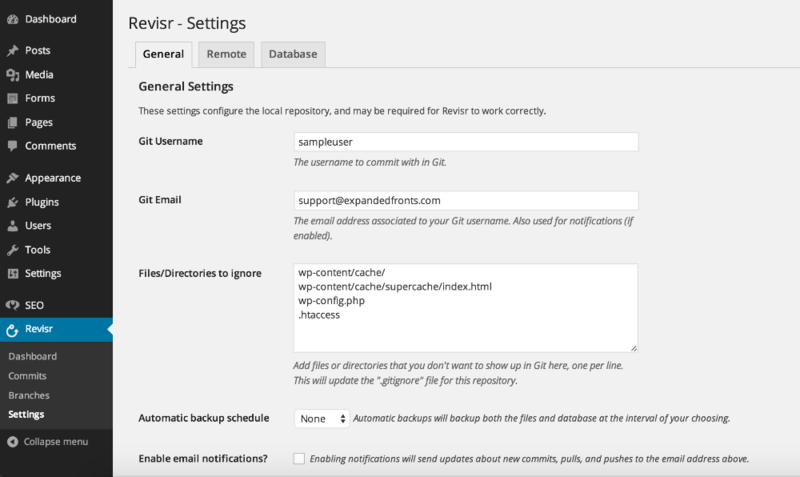 Setting the Git username and email address will automatically update the .git/config file for your repository, and defaults to using your WordPress username and email address if you created the repository from within Revisr. It is also on this page that you can decide which files or directories should be excluded from the repository (via .gitignore). What you decide to ignore or track will largely depend on the site or project – or if you’re just using Revisr as a backup solution for your entire website, you can leave this section blank (aside from wp-config.php if it’s a public repo). The final setting worth noting is the “Automatic backup schedule”. If set, Revisr will automatically commit any modified or untracked (but not ignored) files and backup the database at the interval of your choosing. Combine this with the auto-push functionality (explained here) and have peace of mind with lightning fast (and free) daily or weekly off-site backups.